These pages are a repository of information relating to things I have built that might interest others. It also includes some bloggs which may not be as interesting. I was first licenced in 1961 and went on ait with an SCR522 WW2 aircraft transmitter, a super-regen receiver and a folded dipole. 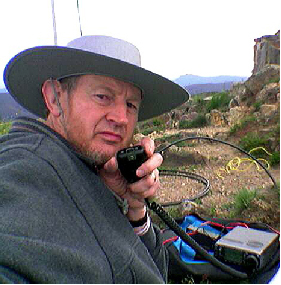 Yes that very serious bloke is me, trying to take a photo of my operation on the summit of Mt Buller in Decenber 2004. The camera operated before I smiled! Equipment: a backpack station including an IC706 MkIIG and a MFJ 2m/70cm 4 element beam. Power was from 12 V gelcel. Operation was primarily aircraft enhancement on 2 m and 70 cm into Sydney and Canberra. If you can’t see an item, use the “next” or “previous” button at the top right of the frame to navigate. I have used my own photographs, technical flaws and all, rather than use the off the shelf perfect ones. I hope you find some interesting. I will add to them over time. This entry was posted in Uncategorized by vk3afw. Bookmark the permalink.